Jocelyn McCoy, ’12, MOL ’15, currently serves as the senior outreach recruiter for Trevecca’s School of Graduate and Continuing Studies. 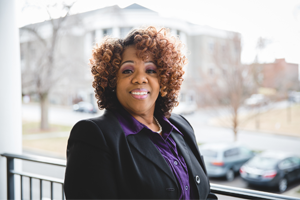 In her Trevecca story, McCoy shares how Trevecca helped her to finish her degree and pursue a master’s. Today, McCoy is a key part of helping many of the students in Trevecca’s School of Graduate and Continuing Studies (SGCS) start their own Trevecca stories. So life happened. I got married and had kids, but I always wanted to go back and finish. I literally watched the MHR (Bachelor’s of Arts in management and human relations) for 10 years. All of the fears that I hear now when I talk to students—those were all my fears. Can I even do this now? Will the younger students be better than me? Finally, I did what Christians are supposed to do, and I prayed about it. When I prayed, I knew I needed to go. I got laid off from my job in 2010, and my husband said, “You’ve always wanted to go back to school. Now’s the time.” So I went to an info session. I thought I had 60 credit hours or so to transfer in, but it turned out, because it had been so long, that I only had about 48 credit hours. I just started to cry. My adviser, Pam Costa, said, “Do you want this degree? If you want this degree, we can put you on a plan to make it happen.” So that’s what we did. I had promised my mom before she passed away that I would finish my degree, and when I did, I felt a sense of gratification and thankfulness that God would push me in the right direction. Four months after graduation, I got hired at Trevecca. A year later, I started the master’s program in organizational leadership. The more I looked at it, I thought, that’s me. That’s what I do. This time I was juggling working full-time and getting my degree. My kids were so proud. My husband—he was my biggest supporter. If you're ready to take the next step toward finishing your degree, click below for more information.